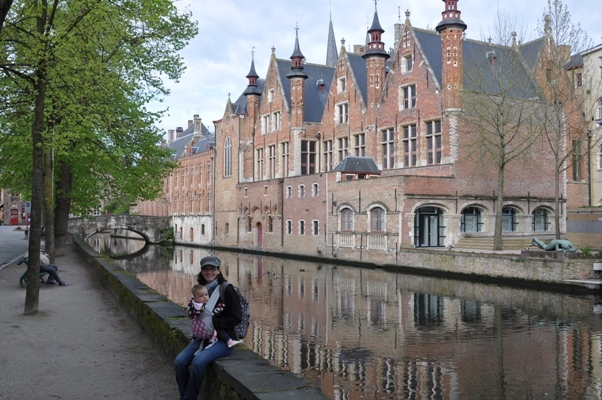 Erynn and I decided to take a long weekend and tour western Flanders in Belgium. 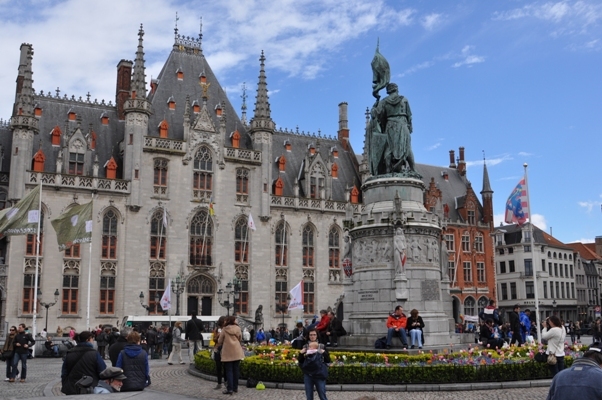 We had heard wonderful things about Bruges/Brugge (all of the towns have multiple spellings) and also visit the In Flanders Field Museum. 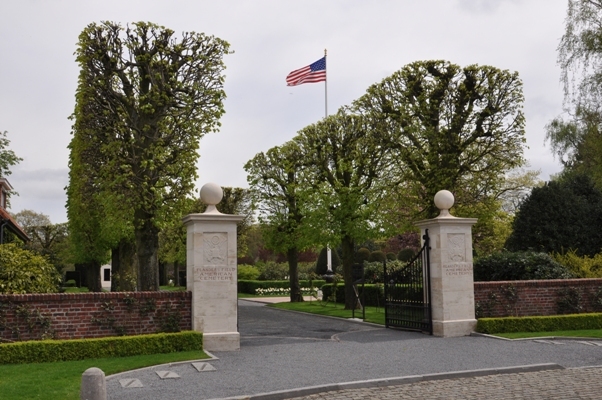 While in the area we also stopped for a day in Ghent and on the way home hit the Flanders Field American Cemetery in Waregem. 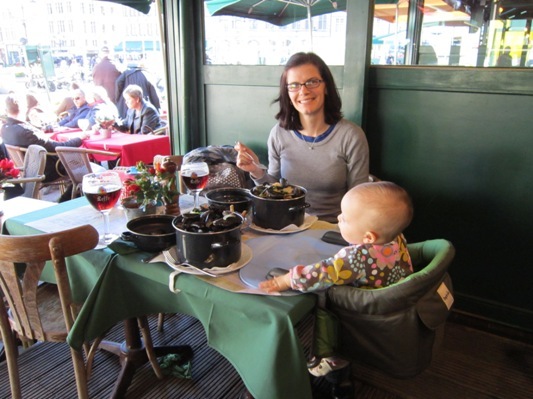 Being that it was April the weather was not ideal, but we were able to sample some mussels and pommes mit mayo. 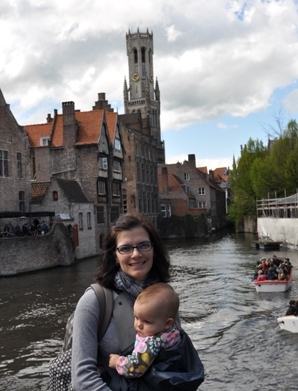 Greta did great on the trip since this was her 15th country in less than 11 months. 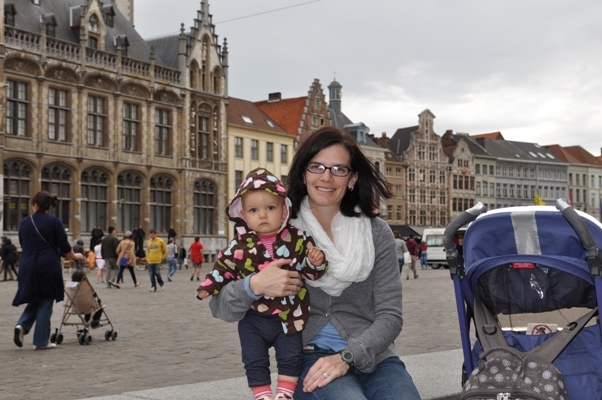 Not too shabby for our little world traveler. 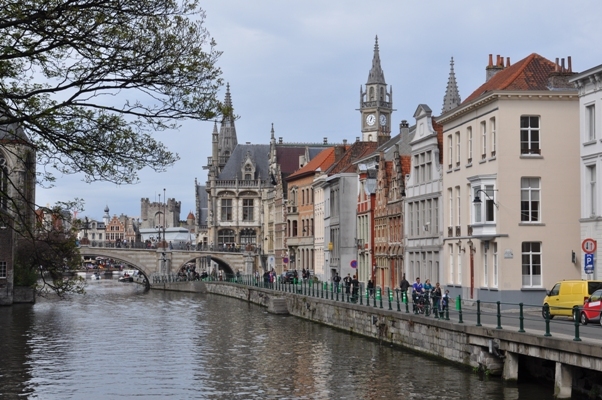 For full resolution photos from the trip to Bruges, Ghent and Ieper click here. 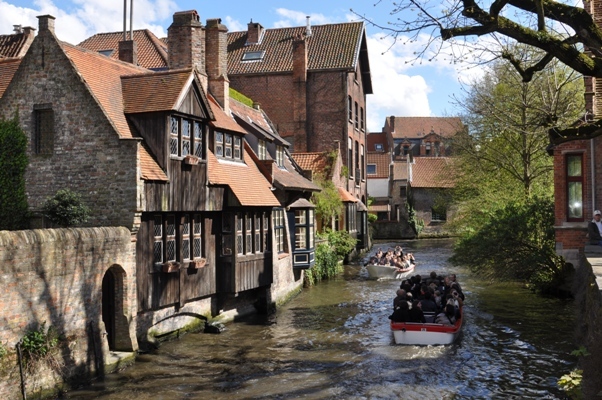 It is repeated often in the movie In Bruges the city is like a fairytale city. 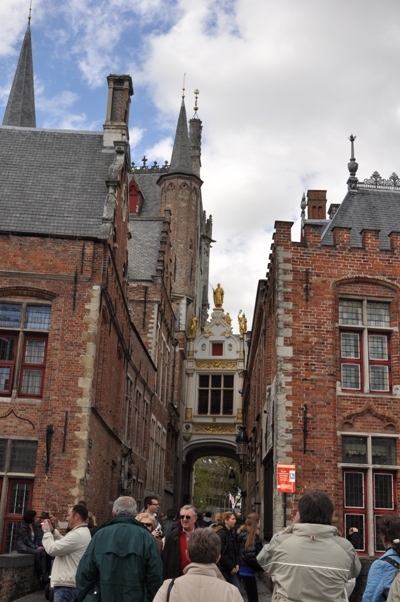 Lots of tourists and amazing medieval buildings in the old city. 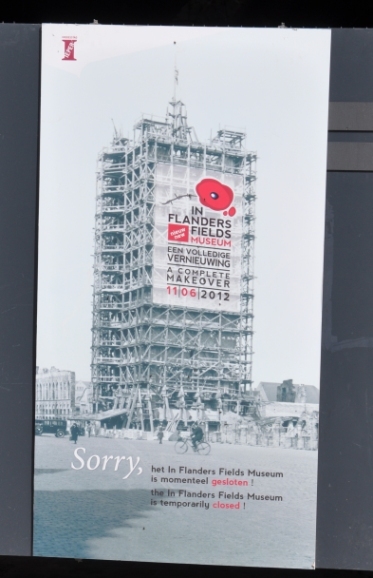 We spent the day just walking around and trying to time our museum visits with the rain showers that came and went. 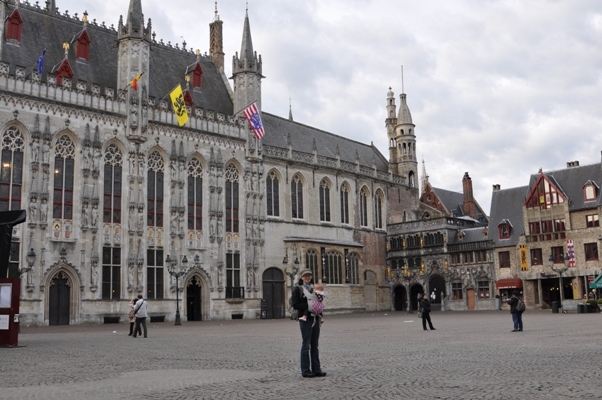 The above photos are in the main square, or Markt, of Bruges. 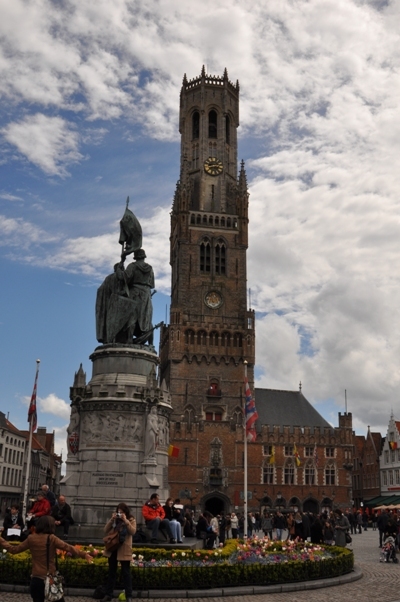 The right photo shows the Belfort (belfry) that dominates the square and is featured prominently in the aforementioned movie. 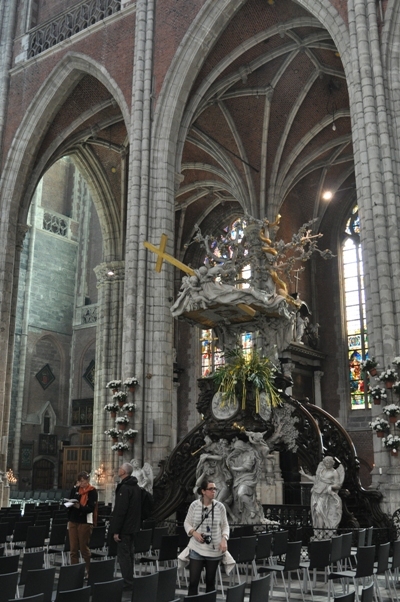 The statue is of Pieter de Coninck an Jan Breydal. 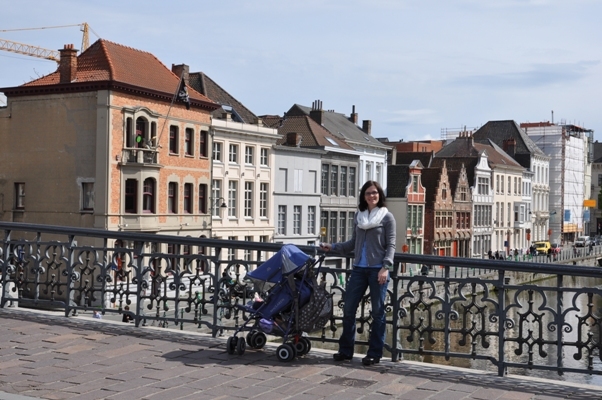 The thing to do in the Markt is take photos, hitch a ride in a horse drawn carriage and eat mussels at one of the tourist eateries lining the square. 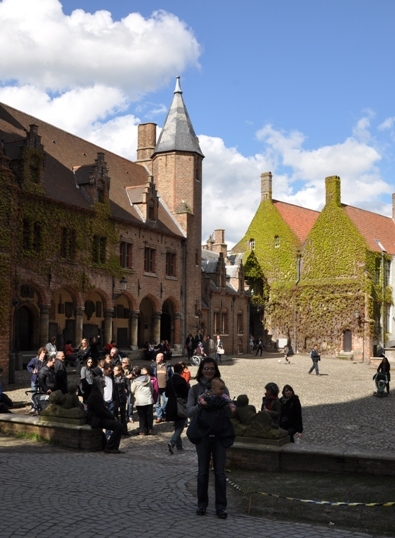 Just of the Markt is another large square called the Burg. This was also where our hotel was. In the picture with Erynn there is a small ornate building just to the right in the photo. It looks wedged between the big building on the left and the red building on the right. 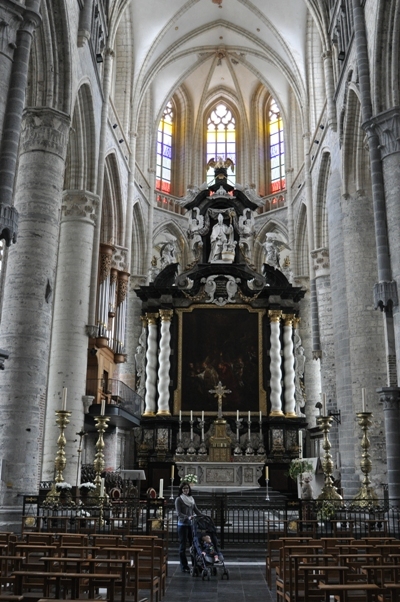 This is the Basilica of the Holy Blood. 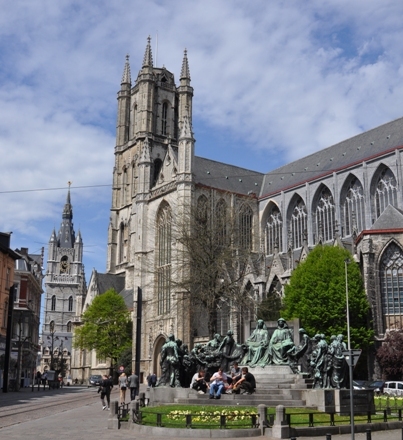 Legend has it that during the Crusades a guy brought back some of Jesus' actual blood and this basilica was built to house it. 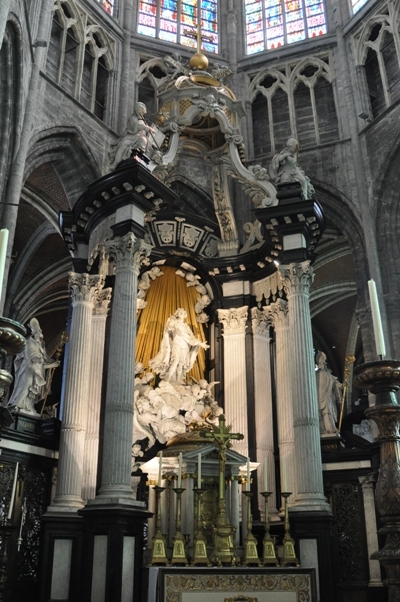 Here are a couple pictures from inside the Basilica of the Holy Blood. 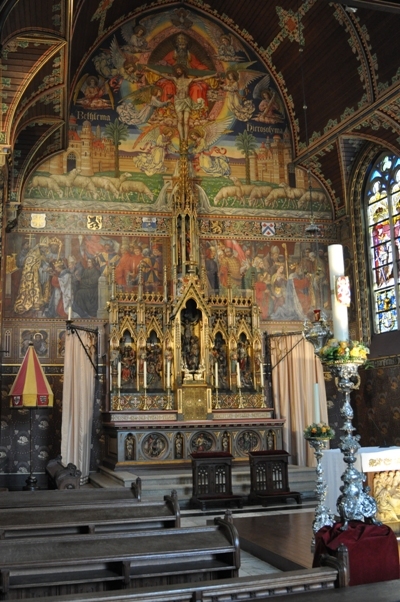 Both are from the more ornate upper chapel. 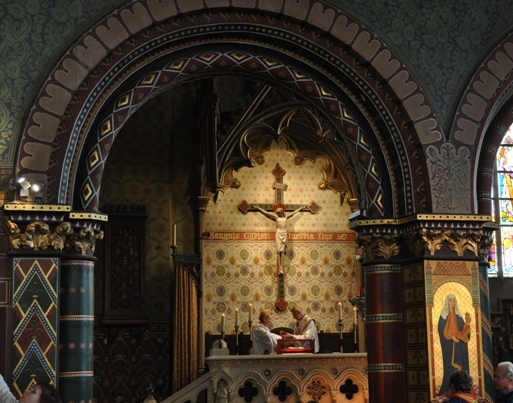 The right photo has the priest watching over the holy relic itself. 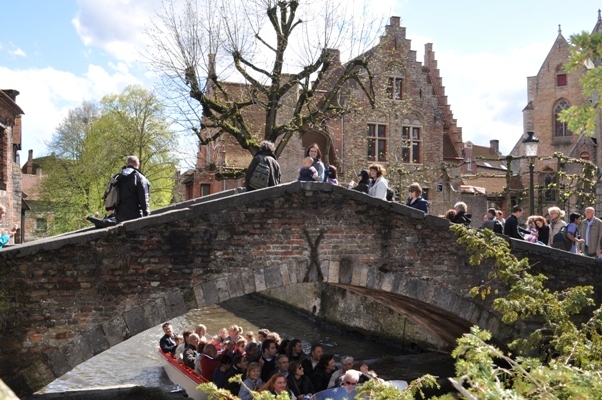 Leading off the Burg Blinde Ezelstraat, or Blind Donkey Street, and the Steenhouwersdijk that runs along the canal. 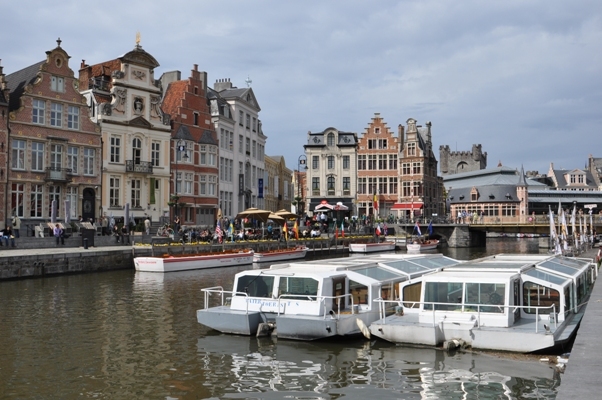 It's a pretty area that affords some nice views of the historical buildings, the fish market, one of the main canals, and is the spot to pick up a canal boat tour. 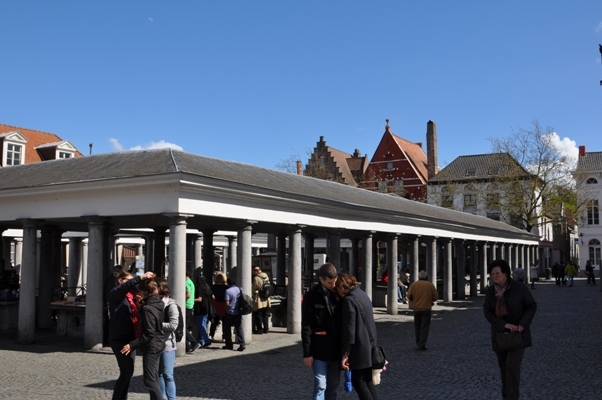 The left photo shows the fish market. 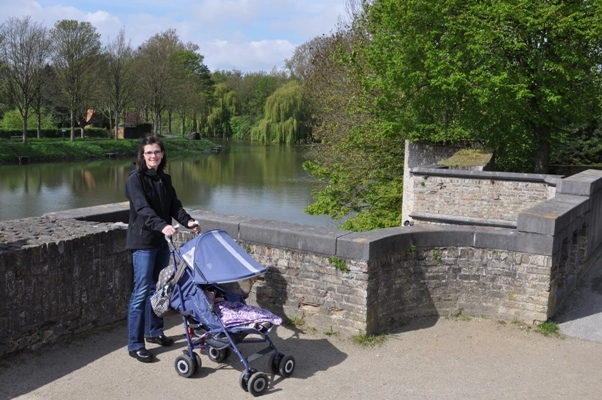 The right photo is just another pretty photo from our morning stroll along the Steenhouwersdijk. 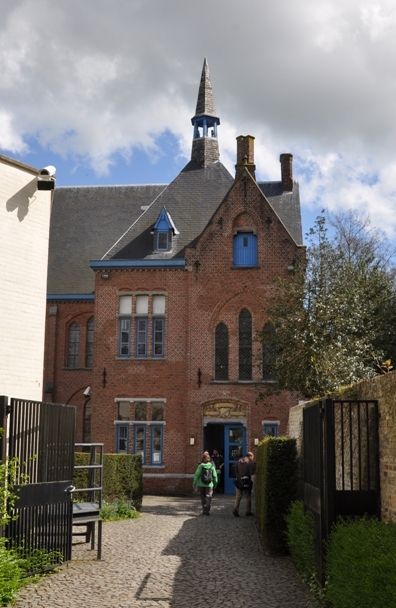 We headed into the Groeningemuseum (left photo), which houses a fine collection of Flemish paintings over the centuries. 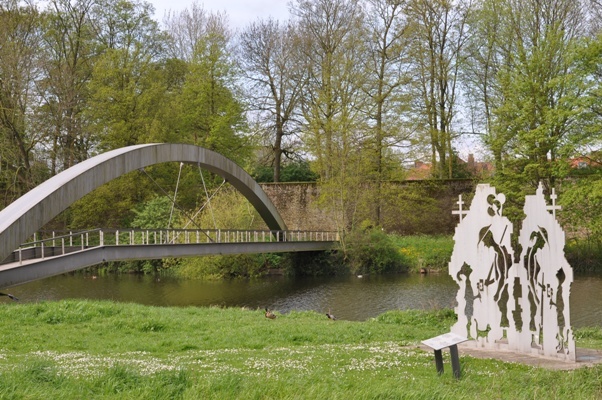 Just outside of the museum is the St. Bonifaciusbrug, which is also known as the "kissing bridge" (middle photo). Of course, I gave my two girls a smooch! 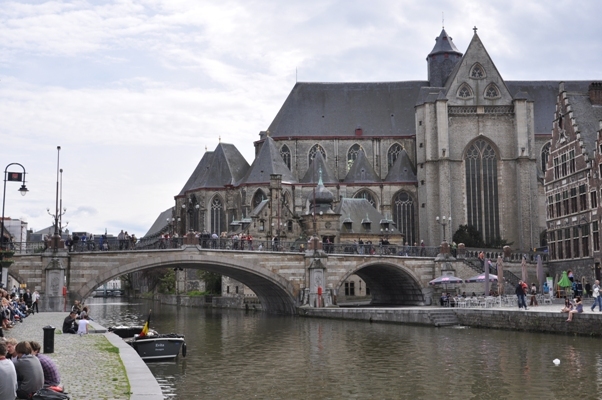 And then it was onto the square next to the St. Salvatorkathedral and more photos. 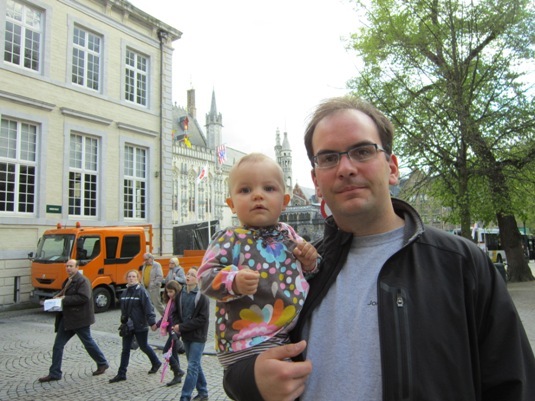 As with many of our trips the itinerary revolved around food. For dinner we had the moules (mussels) as mentioned above. I also made an early evening run to get Erynn a nice Belgium waffle that was made up like a banana split. 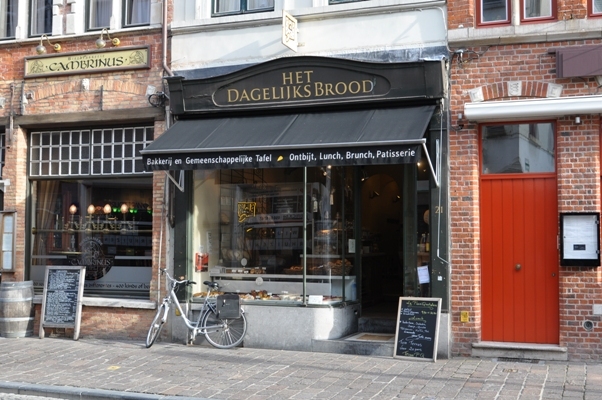 Then the find of the trip was this perfect little bakery and kitchen near our hotel called Het Dagelijks Brood (Our Daily Bread). Super yummy and very reasonably priced. Two of us ate for the price of one at the hotel. 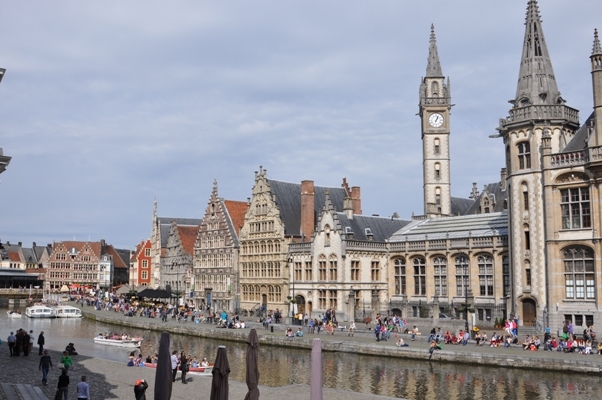 Ghent is slightly smaller and not quite as well preserved as Bruges and a little more spread out, but is still a gem. 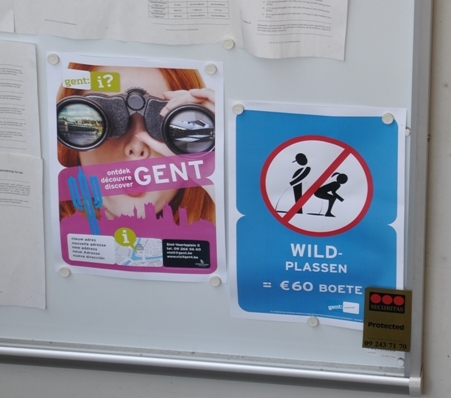 In fact, the number of tourists was significantly less and I believe Erynn and I preferred it to our time in Bruges. Somehow it was just a little more accessible and interesting for our taste. 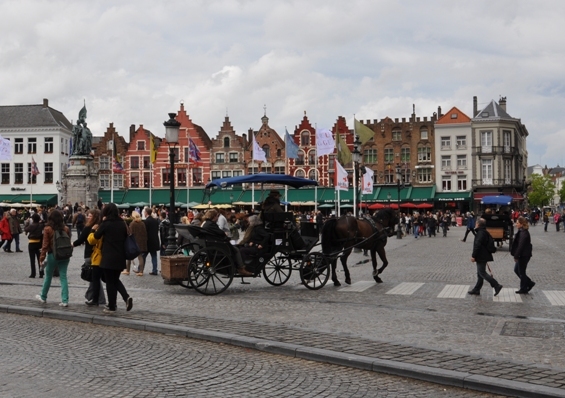 Walking on a couple hundred meters you come to one of the main squares -- the Saint Baafsplein. 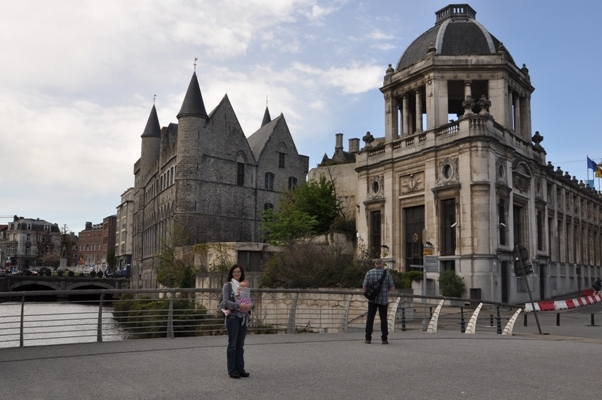 From left to right you can see Erynn and Greta in front of the Ghent Belfort (Belfry). 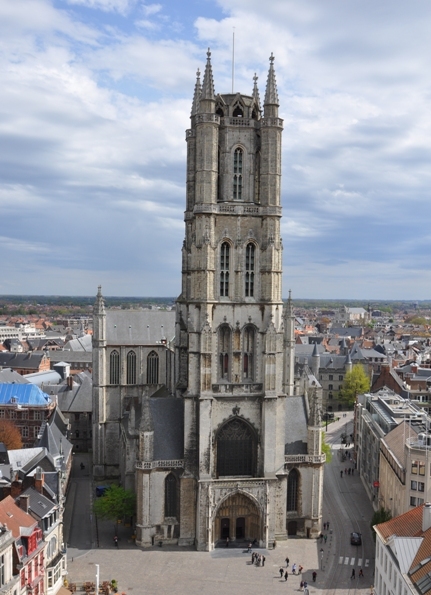 In the middle is the Schouwburg (no idea) and the right photo shows the St. Baafskathedraal taken from the top of the Belfry. It's a standing joke in our family that if there is a tower on our vacation we will inevitably climb it. 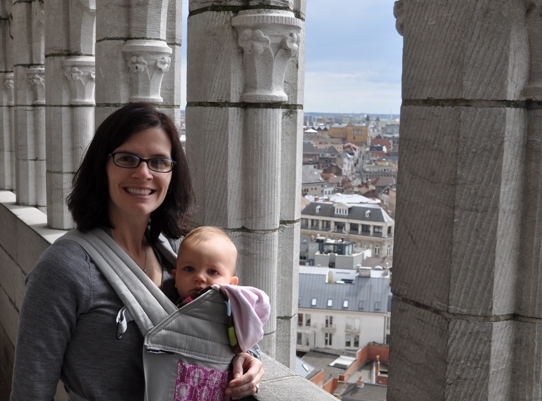 The tradition started on our first international trip together to Paris when we climbed to the top of Notre Dame in the September heat. Erynn likes to climb stairs, Doug does not. 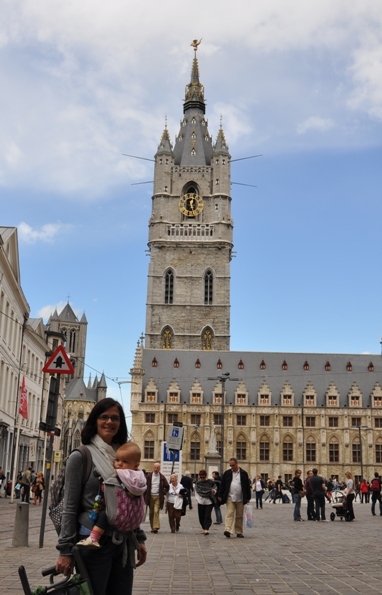 Fortunately the Ghent Belfry had an elevator for Doug and Erynn could climb the stairs... with Greta strapped to her. This was not by design. The plan was Doug would scamper up the tower to get some good pics and Erynn would wait on the first floor. After a few minutes Erynn decided to just go for it and not wait. Doug found the elevator. Erynn did not. Everyone wins! Here are some photos from the Belfry. 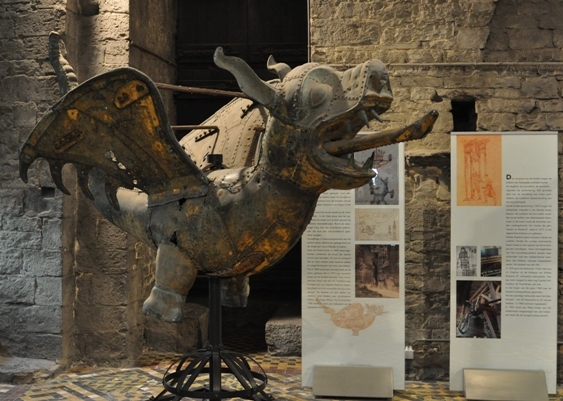 The tower was topped with a dragon weather vane for centuries, and the dragon has become the mascot of the city. The right photo shows one of the old weather vanes taken down and then replaced with a newer one. 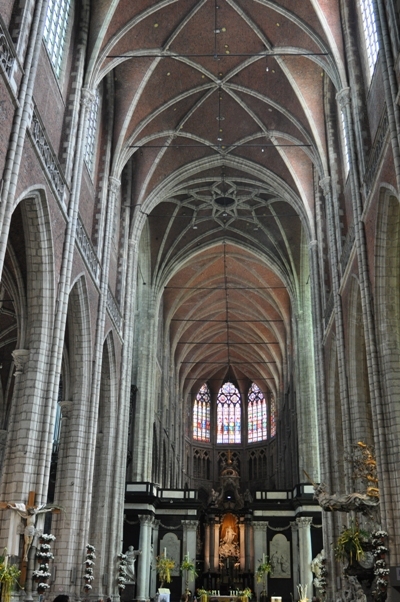 Here are some photos from inside St. Baafskathedraal. 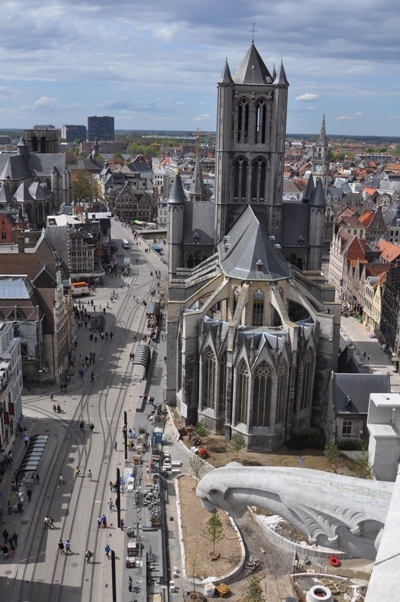 The next big square is the Korenmarkt with the St. Niklaaskerk (left photo taken from the Belfry). 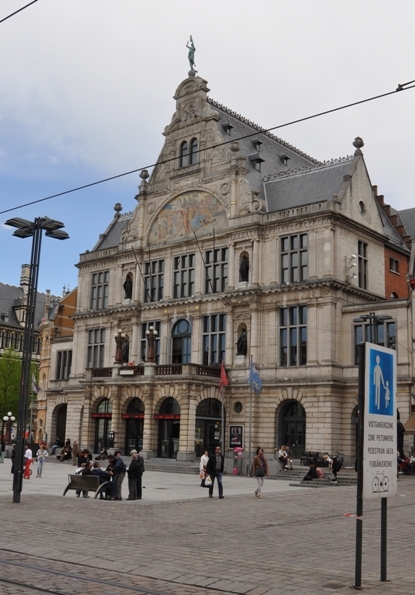 Following on from the Korenmarkt is the Graslei Watefront. 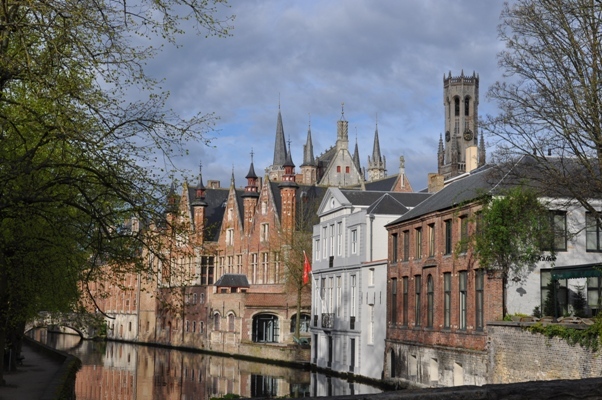 As you can see this area is special with the canal and old buildings. Apparently it was made to look older than it is due to some exhibition in the 1800's. Which is funny that even in the 1800's people wanted the "historical" experience of even a couple hundred years before that. 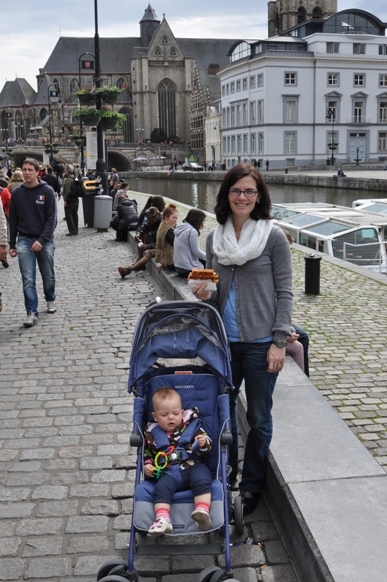 Yes, this is Erynn with a Belgian waffle in Belgium! Yummy! After eating our snack we just walked around a bit while Greta took a nap. What a beautiful place! 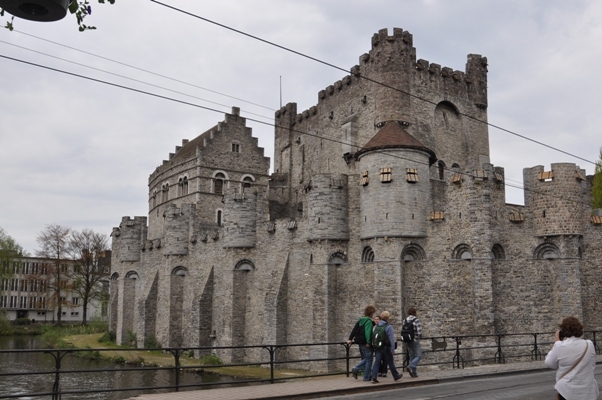 Last up on our walking tour of Ghent was the Gravensteen, which is an old fortress charging 8 Euros for entry. We said no thanks, and starting walking back to our car. 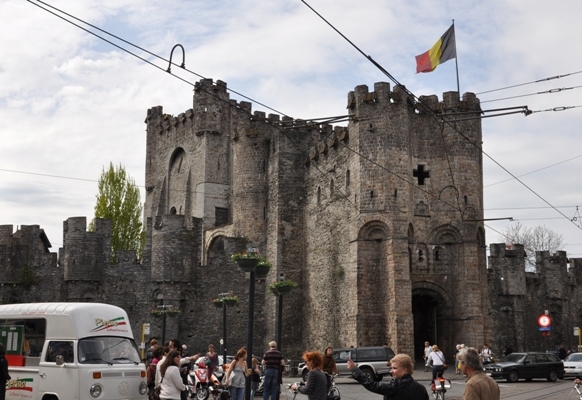 It was built in 1180. 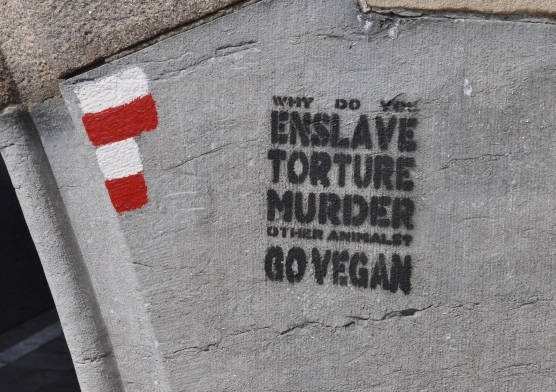 No, thankfully I did not piss while in town, and I guess I'm not vegan because some animals taste good. Greta is at a fun age. She's becoming very interactive and is crawling everywhere. She also has a fascination with zippers. Couple those facts with Erynn putting her jeggings on her head and hilarity ensues. 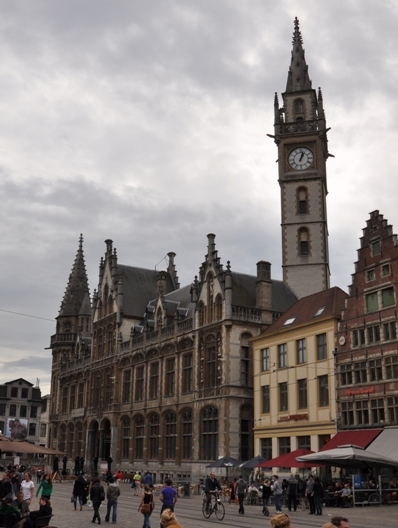 The main square is called the Grote Markt (Large Market) and is shown above. 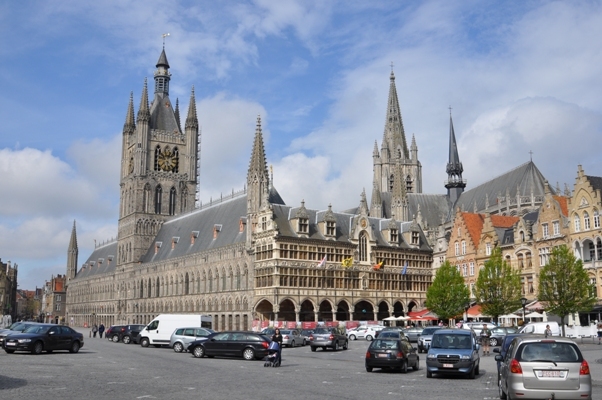 It contains the amazing Cloth Hall, which is a testament to how lucrative the weaver trade was to the Flemish centuries ago. 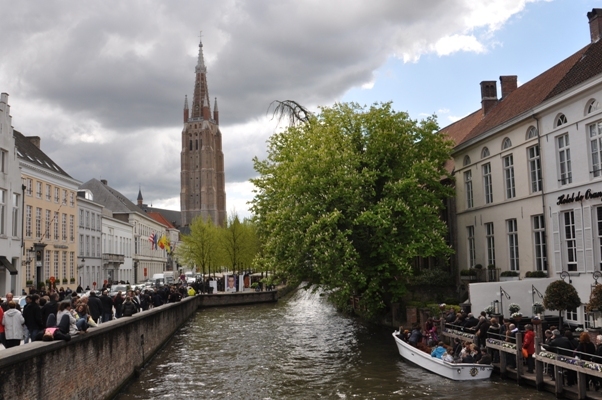 The town and museum are famous for the poem In Flanders Fields written by John McCrae after the Second Battle of Ypres during WWI. 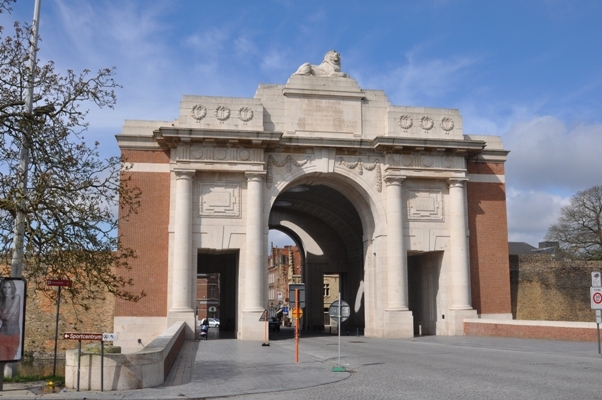 About 200 meters from the Grote Markt is the Menin Gate, which is dedicated the soldiers of Britain and the Commonwealth who were killed in the Ypres Salient of the First World War and whose graves are unknown. 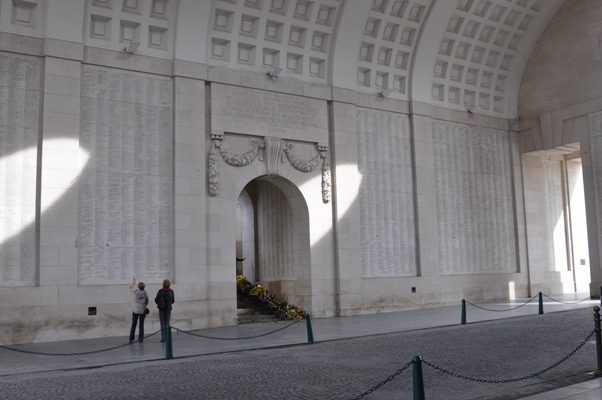 The walls contain 54,896 names. 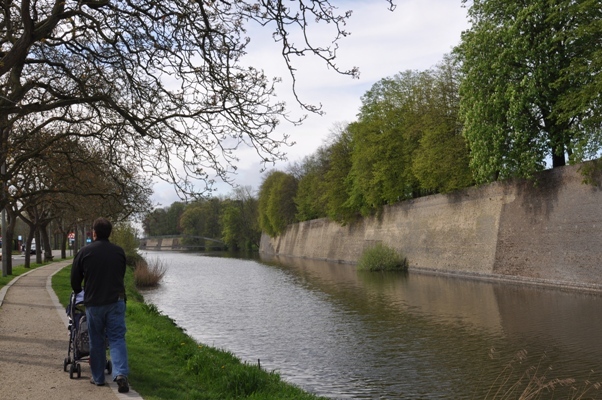 Ypres has some of the best preserved ramparts in Europe and we spent about an hour walking around the perimeter of the old city. Very pretty and peaceful. 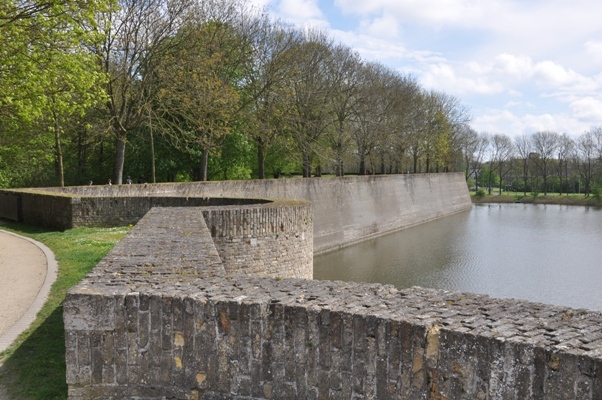 At the conclusion of the walk and next to the Rijselpoort gate is the Ramparts Lille Cemetery, which holds soldiers from all over the Commonwealth. 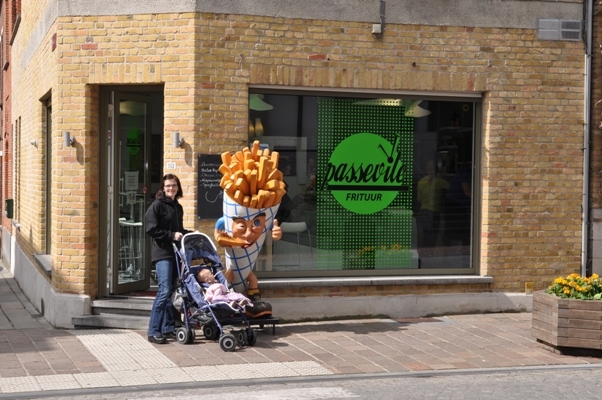 On our way back to the car we stopped for some yummy Frites mit Mayo (Fries with Mayonnaise), another thing Belgium is famous for. After leaving Ypres on our way back to our home in Germany, we made one last stop in Waregem to visit the Flanders Field American Cemetery. 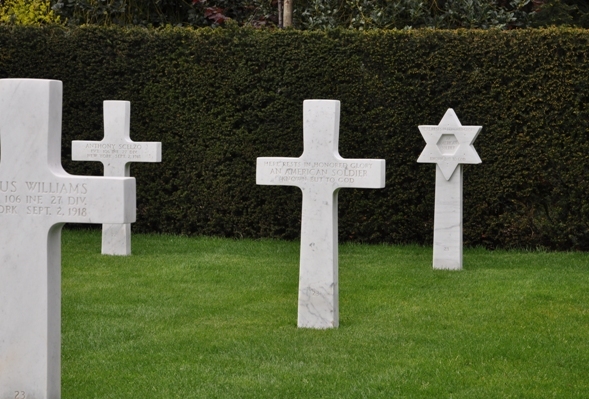 The American battlefield cemeteries in Europe are immaculately maintained and somber places. 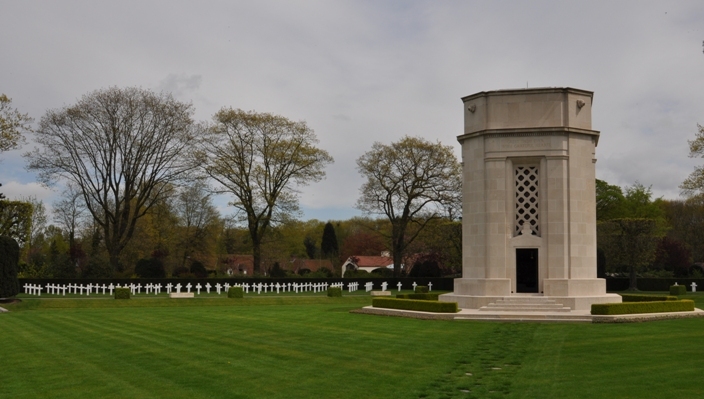 We've visited many in our small attempt to remember American servicemen's supreme sacrifice. 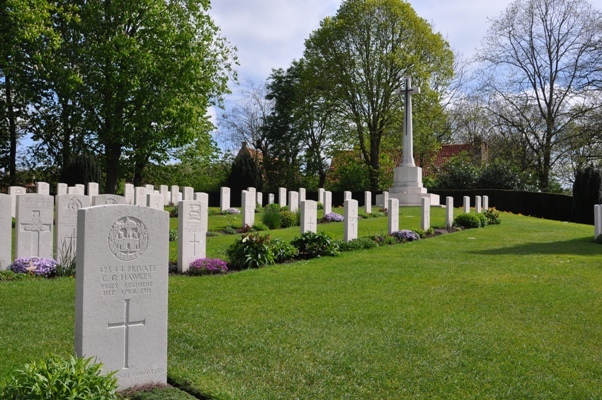 The cemetery is the smallest in Europe overseen by the American Battle Monuments Commission. 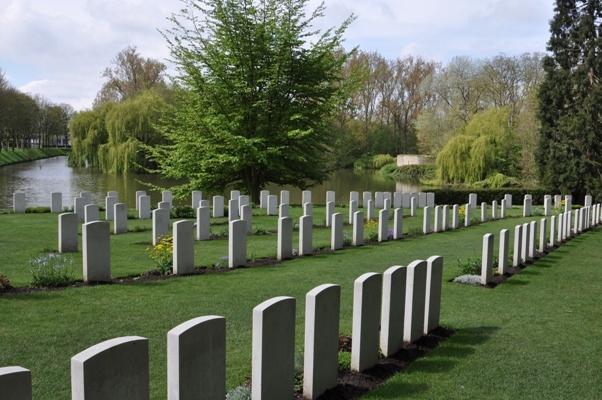 The 6.2-acre site contains the remains of 368 of our military dead who gave their lives liberating Belgian soil in World War I. If you are feeling that your life is hectic, out of balance, or lacking perspective, I encourage you to visit a place like this.